Each week, the Travel News section in PLUME VOYAGE will inform you of news concerning luxury, boutique hotels, luxury hotels, charming places and the travel world and light journey in general. To continue the month of February, Travel News invites you to enjoy the Thai New Year at The Peninsula Bangkok, to discover the new suite at the Majestic Barcelona dedicated to the poet Antonio Machado, to listen to the playlists of British Airways put together by stars rock, and congratulate the most well known airline in the world, Emirates Airways. Does this give you ideas for your travels? Mick Jagger and Rufus Wainwright create a playlist for British Airways. Every month from now on, British Airways will offer its passengers the opportunity to enjoy music playlists put together by music legends. 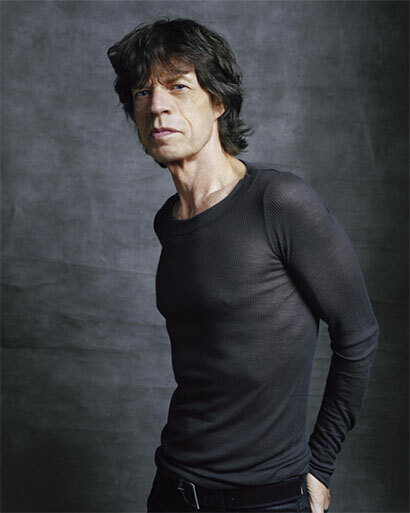 In March, the selection will be made by Mick Jagger. And in April, Rufus Wainwright will share the music closest to his heart. The Mick Jagger selection will allow passengers to listen to and discover several artists such as Saif Keita, the Malian singer and Fela Kuti, singer, saxophonist and conductor of the Nigerian orchestra. In April, Rufus Wainwright will share the ballads of Angélique Kinjo, a Benin singer, The Gloaming, an Irish music band, and Mostar Sevdah Reunion, a musical ensemble from Bosnia and Herzegovina. Emirates, the most prestigious airline brand in the world. Emirates has been named “the most valuable airline brand in the world” by the Brand Finance Global 500 2014 report for the third consecutive time. It was also nominated for the fourth consecutive time as “the most prestigious brand in the Middle East”. With a fleet of 212 aircraft, Emirates’ network operates from Dubai to 141 destinations in 80 countries. The company’s multicultural staff, consisting of more than 48,000 employees with a little over 180 different nationalities, helps establish the brand as a pioneer in its field. 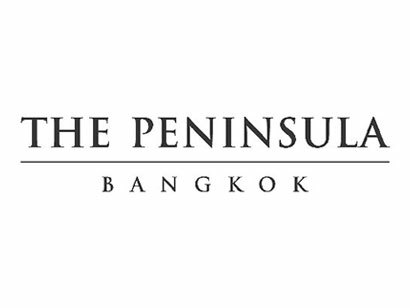 The Peninsula Bangkok celebrates the Thai New Year. Over a period of three days starting from the 13th of April, the Songkran marks the Thai New Year. Here is an opportunity to immerse yourself in the local culture by discovering the highlights of the Water Festival at the Peninsula Bangkok. To enjoy the festival (Songkran in Thai), each hotel guest will receive a “Songkran Survival Kit” containing a water gun filled with scented rose water, and a traditional costume. Activities and shows are also scheduled during the duration of the festivities so that guests of the Peninsula can discover Thai culture. To continue the experience, the Peninsula Spa is offering “Spa Splash” treatments to refresh the mind and body and beat the heat of summer. Opening of the Pullman Saigon Centre. 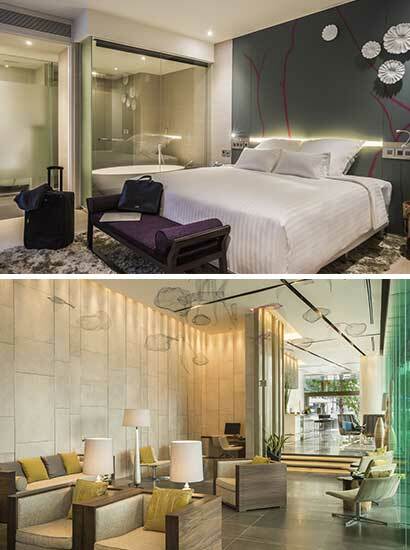 Pullman has opened its third hotel in Vietnam, in Hô Chi Minh City. The hotel is situated in a prime location at the country’s economic centre, in the heart of District 1, near Ben Thanh market and tourist attractions, with stunning views over Saigon. Its 306 rooms, including 17 suites, boast a contemporary décor and multiple technological mod-cons. With their sleek, modern design, they are thought of as bubbles of calm and privacy, suitable for rest, relaxation or work. The hotel’s three restaurants show appreciation for a cuisine inspired by both local and international favourites. «Inspired by Her», MGallery launches services exclusively for women. MGallery, the collection of upscale hotels, is launching a new incentive that focuses on services and special attention for women. 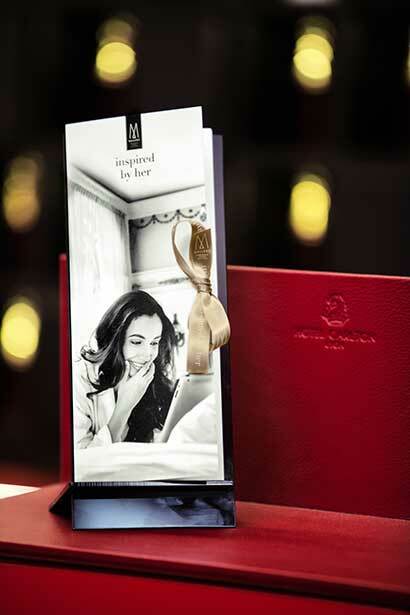 This offer, “Inspired by Her” is currently launched in four hotels in France: the Carlton Lyon, the Grand Hôtel de Cabourg, the Grand Hôtel du Roi René in Aix-en-Provence and the Hôtel Baltimore in Paris. Female clients will be given the option, depending on availability, to choose the location and size of their room – for example, a smaller room for a heightened sense of comfort. Bathrobes and slippers in their size, hangers for skirts as well as a wide selection of infusions teas are all amongst the specialised offerings for MGallery’s treasured female clientele. And to go one step further, the hotel will provide Wolford tights, manicure kits, various creams and treatments to buy offered in partnership with the OhMyCream! Range. This offer will soon be extended to all 70 hotels in the group’s network by the end of the year. Princess 54, the new private yacht of the Peninsula Shanghai. The Peninsula Shanghai has launched a luxury yacht, unique to Shanghai, for private cruises for guests of the hotel, along the Huangpu River. Decorated in the colors of the hotel, this stunning 16.5 meter yacht is the ideal vessel for unique excursions. 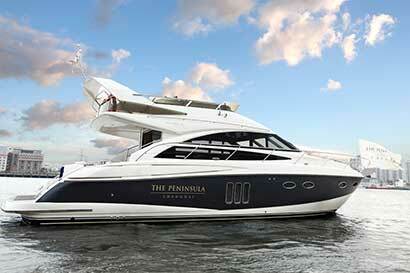 It goes without saying that the Princess 54 has been fully furnished with upscale amenities. A U-shaped sofa with a central table on the starboard allows guests to relax while enjoying a fabulous panorama of Shanghai. Personalized stays at Flocons de Sel. A starred chef to cook for you, and you alone? Make this dream a reality at Flocons de Sel! Emmanuel and Kristine Renaut are welcoming guests in the exceptional brand new suite that was recently opened in the hotel. 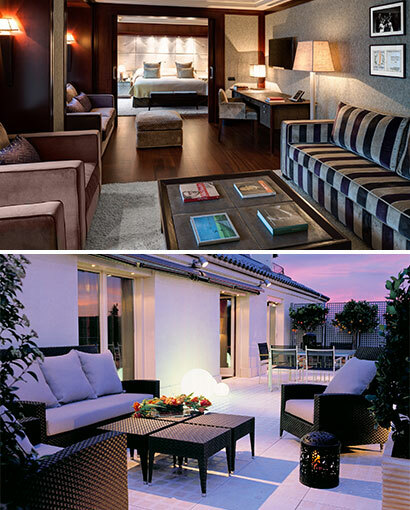 The 160 m2 suite is an idyllic cocoon of well-being, serenity and felted luxury. With a warm and elegant décor, the suite is distinguished by the refined materials and colors used, as well its exquisite private garden. But it is the semi-open kitchen that is the real star…After a pleasant afternoon of skiing, Emmanuel Renaut resumes his role as a three-star chef and installs himself in the suite’s kitchen and concoct an unforgettable meal for its residents. Amazing signature dishes as well as all-new creations, one is transported to the stars in an extraordinary gourmet journey. Gourmet snack break at the Chalet de Pierres. An iconic institution of Courchevel 1850, the Chalet de Pierres is the perfect spot to relax between runs and enjoy its new snack menu. At the foot of the Verdons piste, in one of the old Austrian-esque mazots on the hotel’s large terrace, a kitchen has been equipped to satisfy small stomachs and big cravings. On the ‘Mountain Snack’ menu, prepared by Chef Lionel Horlandynio, are sandwiches made with kneaded sourdough bread and baked in the Chalet de Pierre bakery, alongside delicious hamburgers with Reblochon and truffles pizzas. 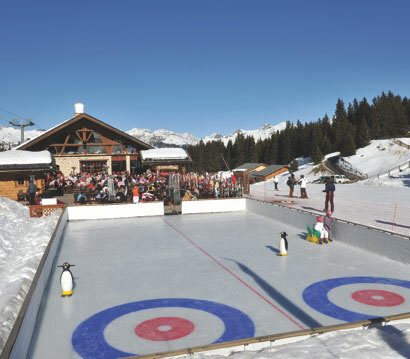 And once the batteries have been recharged, customers can choose to learn about the art of curling on the ice, under the trained eye of Chalet de Pierres’ resident skater. Lunch in a yurt with Le Savoy. 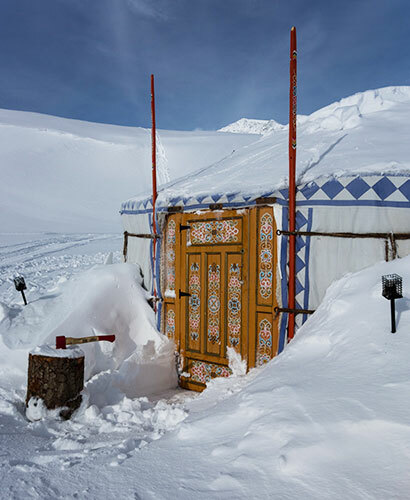 Legendary hotel in Val d’Isere, Relais & Châteaux establishment Le Savoie invites you to enjoy an exceptional meal in the comfort of a luxury yurt. 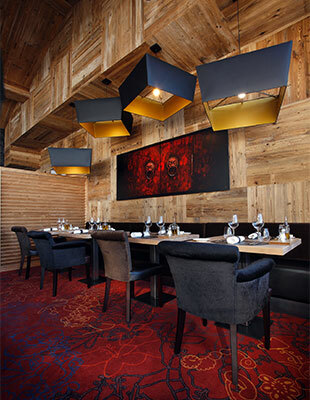 Located on the wild plateau of Tovière at a height of over 2000 meters above sea level, this unique and remote location allows guests to discover the cuisine of Chef Alexandre Fabris, head of Grain de Sel, the Savoie restaurant, in a very unique setting. On the menu are some of the chef’s signature dishes that highlight local seasonal produce. By combining very high-quality produce in the greatest dishes of French gastronomy, the young chef (a mere 28 years of age!) has found the magic formula that combines originality with tradition. The Spa hotel L’Hélios in Méribel welcomes young chef Damien Durand. He will head up the kitchen of the hotel’s two restaurants, open all year round. At only 29 years old, Damien Durand presents himself as a chef “of ideas”. Settle on the beautiful terrace for a sunny lunch or dinner in a more refined setting, for two completely different ambiences in two sizeable areas to be served seasonal and high-quality produce. 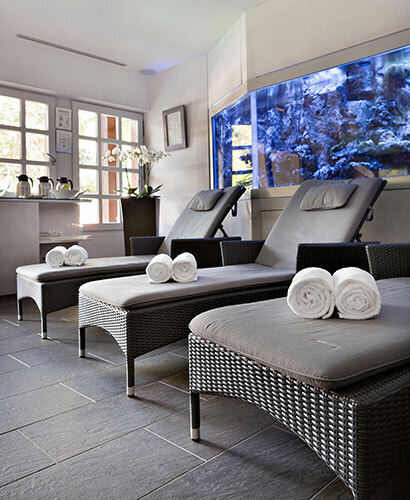 La Ferme des Petites Frasses launches its spa chalet. For its first winter season, La Ferme des Petites Frasses has launched an open air relaxation area in partnership with Aquaflorès. 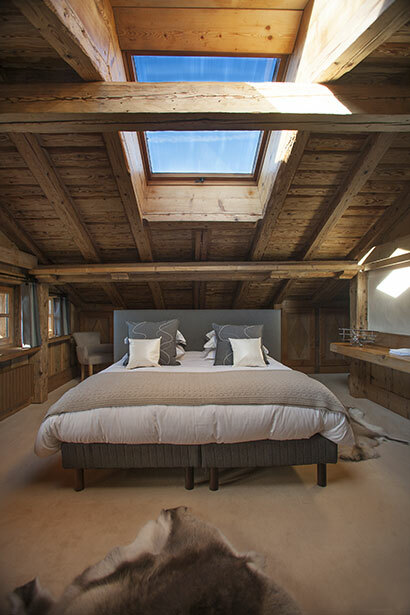 Bordered by nine acres of pasture and woodland and located just minutes from the city center of Megève, La Ferme des Petites Frasses is a haven of simple luxury. This authentic chalet dating from the eighteenth century offers stunning views of Mont Blanc with the possibility of accessing it by helicopter. Guests of this six roomed hotel can enjoy sensational massages, treatments for slimming and sports, and Pilates and yoga classes. A wellness cure to relax after skiing. A Sisley Spa in L’Apogée. 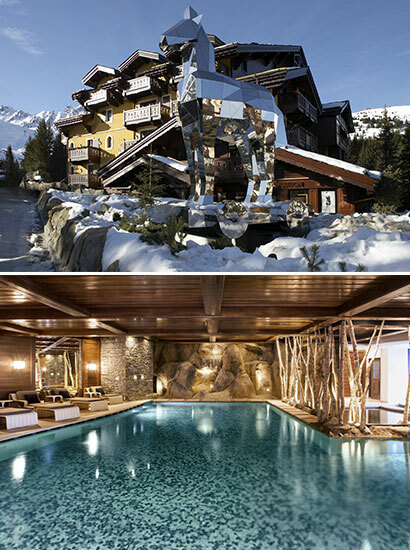 The latest of the major hotels in Courchevel 1850, L’Apogée is home to the ultimate space of wellness and relaxation in partnership with Sisley. In addition to the wide range of treatments available in their six cabins, the spa also has a space dedicated to the beautification of hands and feet, as well as a hairdressing salon, to complete the package. It also has a special cabin designed for the traditional Russian treatment “Le Baniya” which can accommodate two people. Known for its regenerative and de-stressing properties, this treatment aims to stimulate blood pressure while exfoliating and purifying the skin. In addition to this wide range of treatments, coaches and physiotherapists are available to guests to help alleviate any skiing related aches and pains. New Guerlain signature treatments at the Cheval Blanc. An authentic mountain chalet of warm luxury, the Cheval Blanc Courchevel has many new wellness treatments to enjoy after a day on the slopes. This season, four new Guerlain aesthetic massages have been added to the spa’s repertoire. Developed by the Institut Guerlain des Champs-Elysées, these treatments testify to the excellence of the house and its creativity. The ‘BeautyPulp’ face massage aims to plump the skin and smooth lines, the ‘Muscles’ ritual relieves tension after a day of sport, the ‘Dos’ treatment revives the spine and peripheral muscles, and ‘Pieds’ is to soothe the feet and create a feeling of deep relaxation. Total rejuvenation. 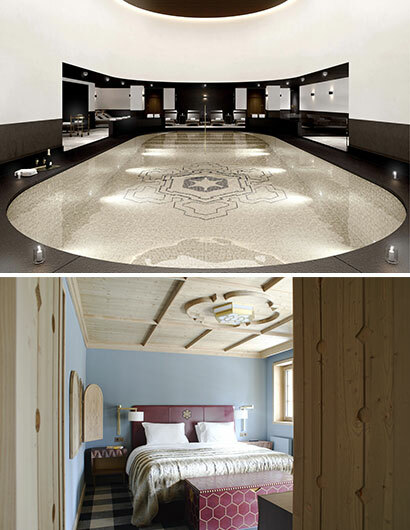 The Grand Aigle Hôtel & Spa reopens with a Pure Altitude Spa. Located in Serre Chevalier, this hotel, whose building dates from the eighteenth century, has recently reopened its doors. It is to the trio consisting of Caroline Carvalho, interior decorator, and Mel & Kio, a plastic artist and poet respectively, that we owe the new atmosphere, which is a true ode to nature. With over 60 rooms, decorated in rough wood and driftwood, stone, cotton and natural fibers which tell the story of this legendary Serre Chevalier establishment. And in order to ensure that the wellbeing of their guests is complete, the hotel has also installed a Pure Altitude spa, a reputed brand that only uses products made from mountainous plants, including some as rare as edelweiss. 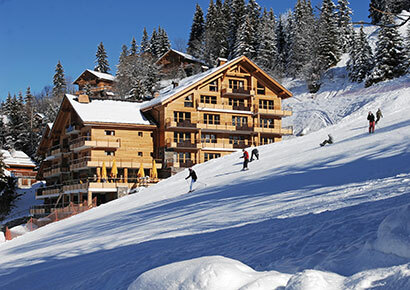 'Sisley à la carte’ at the Chalet du Mont d'Arbois spa. In addition to its exclusive list of treatments, the spa at the Chalet du Mont d’Arbois is now offering Sisley Phyto Aromatic treatments for face and body, exclusive to Megève. Baron and Baroness Benjamin de Rothschild, owners of the Mont d’Arbois, share the same appreciation for quality and respect for nature and man as the Sisley brand. 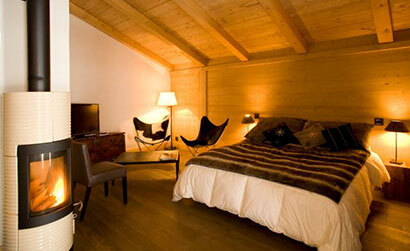 It was therefore only natural that the Chalet added their treatments created especially for the heart to their spa. The range of phyto-aromatic treatments exemplifies the healing powers of the aromatherapy techniques developed by the spa’s specialized team. 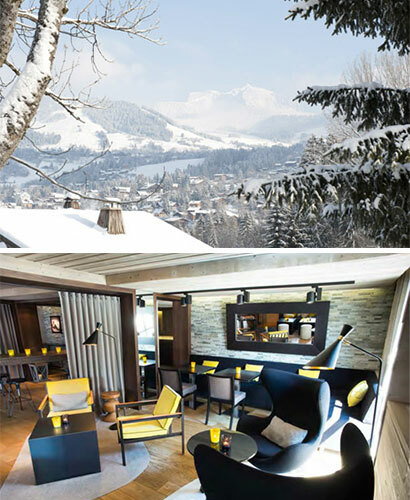 What's New at the Alpaga hotel in Megève. The five-star hotel offers a new lounge restaurant, Onyx this winter with a leaner menu in addition to its gourmet restaurant “La Table de Alpaga” which, as it grows. A renovation of the suites done by designer Pauline Bes Berc who has modernized them, a new cottage, “Angela” and the apartment “Planay” completes the Collection Alpaga, while the spa La Colline offers a new menu with the “Equilibre Parfait” care and a bath that allows you to enjoy the breathtaking views of the Mont Blanc complements all the novelties. A special menu prepared by the chef Christophe Schuffeneckers awaits you on February 14 at the Table de l’Alpaga. And for children, the chef also offers, every Tuesday, a workshop for little chefs at the SMALLable small kids club. 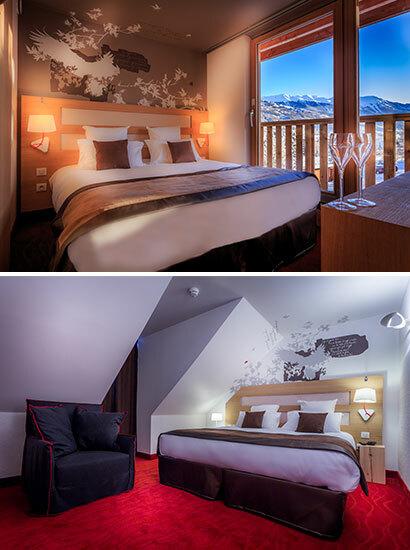 The Koh-I Nor, new 5-star hotel in Val Thorens. At the top of the highest ski resort in Europe, the Koh-I Nor offers stunning views of the Alps and the surrounding circus of Val Thorens, the largest ski area of the 3 Valleys. An ideal spot for a luxurious break with your head in the stars, this five star hotel focuses on personalized service and an upscale positioning. Chef Yoann Conte (double Michelin-starred in Annecy) has prepared a wintery menu that combines exceptional products and a refined selection of aromatic vegetables, spices and mountain herbs, which make for stunning gastronomic results. As for the prestigious Valmont spa, it is defined by the excellent service and omnipresent natural light that defines every aspect of this hotel, which boasts a uniqueness and great sense of innovation. 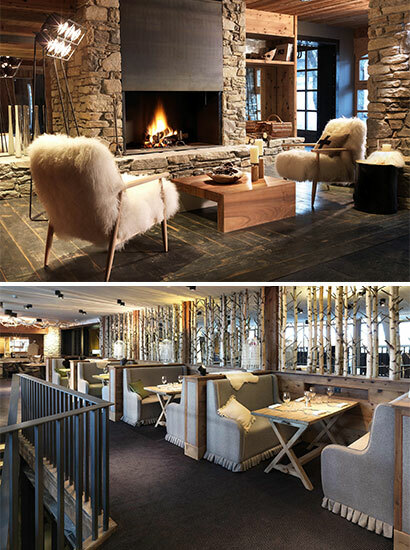 More than just a luxury hotel, The M de Megève opens for its first season. It has been designed like a cottage, a blend of authentic high-end and contemporary style that combines old leather, wood, stones and furs. Each space has been designed to awaken the senses. A symbol of the French art de vivre, this chic hotel is composed of 42 rooms and suites, a spa area, a traditional restaurant and a bistro, an indoor garden and a spacious lobby around a fireplace, and we must not forget, the M bar. The traditional Savoyard style is combined with a modern edge in each room and suite, all luxuriously equipped with lightwood floors and Arpin fabrics. The Fitz Roy wins a fifth star. The mythical chalet that is the Fitz Roy has reopened its doors to an entirely renovated interior and a brand new five star experience. At the heart of Val Thorens and the height of luxury, the Fitz Roy is a romantic getaway in the highest resort in Europe. Standing at 2300 meters, this chalet has been a gathering place for mountain enthusiasts, connoisseurs of elegance and ease, and those who value luxury without ostentation, since its construction. Rewarded with a fifth star in 2013, the hotel opened in time for the start of the season with a new décor that mixes Savoyard authenticity and discretion with the cozy elegance of a large family cottage. Decorated in stone and brushed oak, the beautiful volumes have retained their majesty, while the choice of furniture diffuses a warm and intimate feeling. 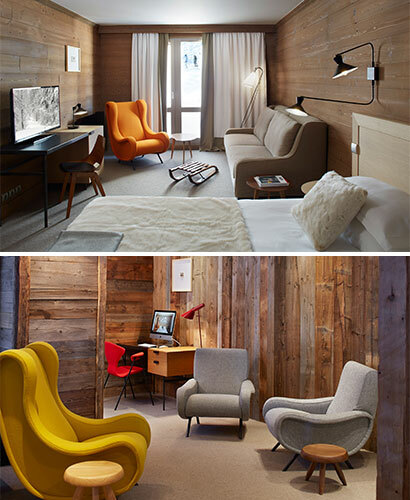 1950s furniture, cozy rooms, mountain atmosphere…the Hôtel des Trois Vallées promises a unique experience at the top. One of the oldest institutions in the resort, the hotel was designed as an inn to accommodate the first mountaineers. Half a century later, the hotel stands as a nod to history and period furniture whilst revisiting the codes of modernity. It’s the perfect place for lovers of design to stay, with furniture by Charlotte Perriand, Jean Prouvé and Pierre Paulin making a perfectly appointed setting for a journey through time, without denying the comforts of a very present-day lifestyle. 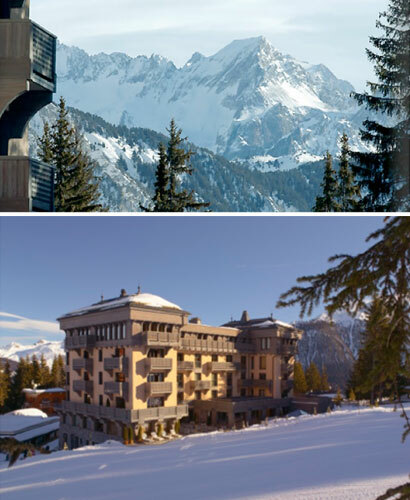 A tribute to “L’école de Courchevel” whose research and early achievements led to the definition of winter sports, the hotel and its 31 rooms are resolutely modernist.